The annual Nan Boat Races are set to be held during 20-21 September and 24-26 October, 2014 along the scenic Nan River. Organizers say the boat racing festival will attract some 200 boats from over 100 communities, with each vessel accommodating up to 60 oarsmen and all dressed in the same racing team’s uniform. 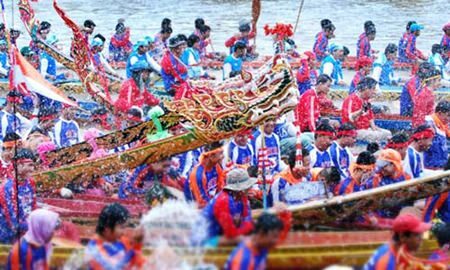 History has it that the Nan Boat Races were initially organized during the local community’s robe presentation to the monks to mark the end of the Buddhist Lent. To-date, the event has become a fixture on both Nan’s and Thailand’s annual festival calendar that attracts thousands of spectators, both Thai and foreigners, and is normally held during September and October each year. Along with the boat racing there will also be a fair with booths selling food and drinks, souvenirs and local arts and crafts indigenous to Nan province. For more information, contact: TAT Phrae Office on 054 521 127 or Nan Municipal Office: 054 710 234 ext. 138-139.